We have been insanely busy getting everything together for this reveal but it has been SO WORTH it! 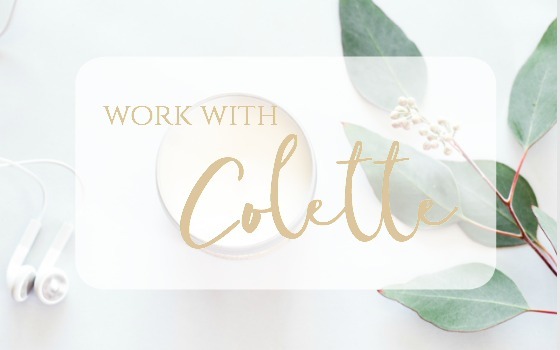 I am beyond excited to share with you our new space and I hope you feel inspired to go a little out of your comfort zone like I did. 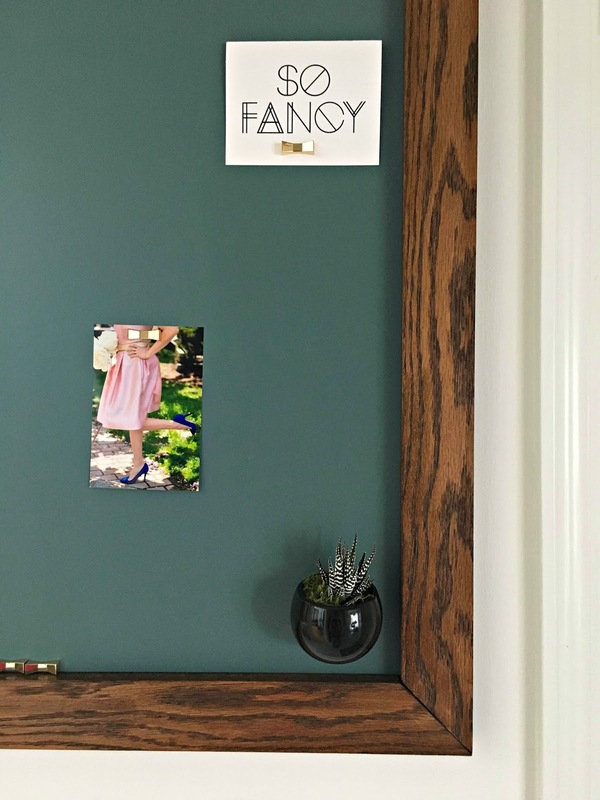 It’s been a long time coming since I first shared our mood board for the entryway back in April. After many months, blood, sweat and tears we can mostly check this space off our to-do list. To see a progress post on the road to getting here today you can check that out here. 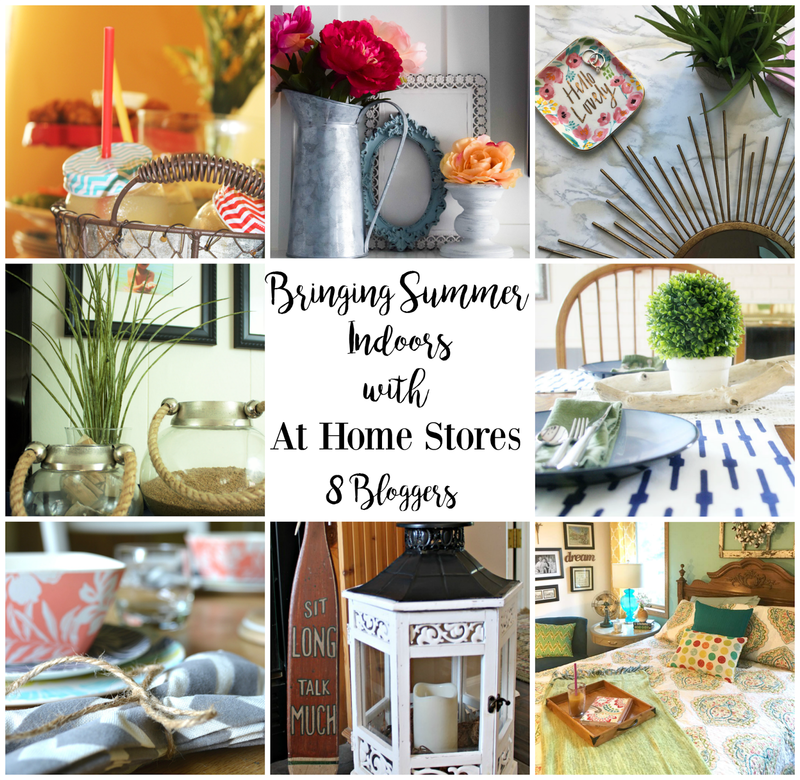 For even more fun, I’ve partnered with several other bloggers (seriously you need to check them all out for oodles of inspiration) and At Home stores to bring you summer indoors! What better way to do so than right in the entryway! 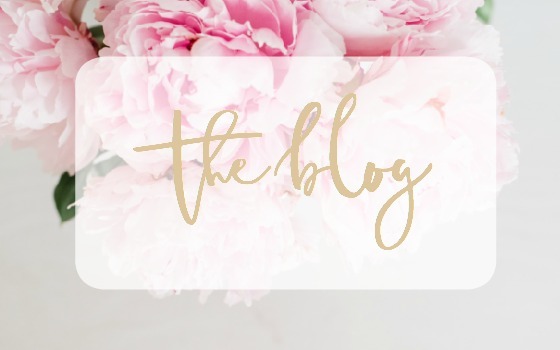 Now I’m not one to really decorate for the seasons aside from a few decor pieces here and there, but if you’ve been following me long enough you’ll know I love anything floral and gold. And nothing screams summer like floral’s and gold like the sun! When ‘At Home’ asked me to participate in this challenge it gave me (and the husband) the kick in the pants we needed to bust out the 20 foot ladder. It’s your typical cookie cutter home boasting maple trim and tan walls. Sure, it’s not terrible and it’s totally live-able. It just isn’t me. The foyer needs to set the tone for the house and this just wasn’t cutting it. We said buh-bye to boring and hello to classically chic. Let’s get started shall we? Warning: This may be a two cup of coffee kinda post. When it came to decorating the space and adding my summer flare, At Home really hit it home (haha pun intended). There store was a warehouse for all things home decor and so affordably priced! They even had a ‘red line’ section with tons of goodies at super clearance. 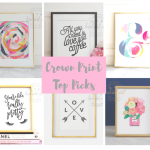 Whether your style is farmhouse, modern, or eclectic there was something to offer everyone. I spent hours perusing the aisles with my bestie and an iced coffee…I was in rug/pillow/mirror heaven. 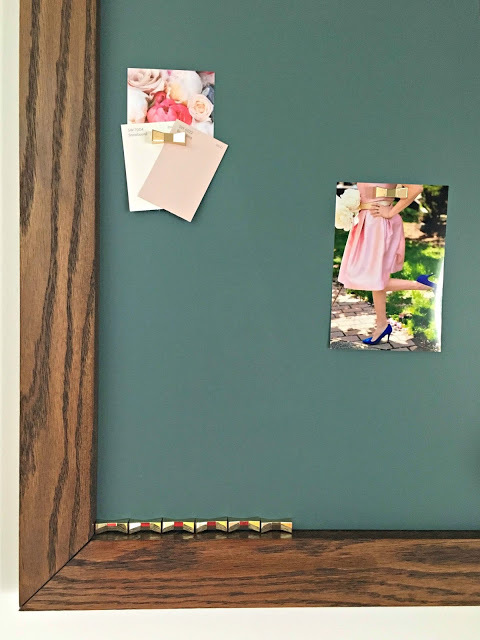 When it came to the color selection I knew I had one shot to get this right…my husband was NEVER going to be painting this again…like ever (cue Taylor Swift). 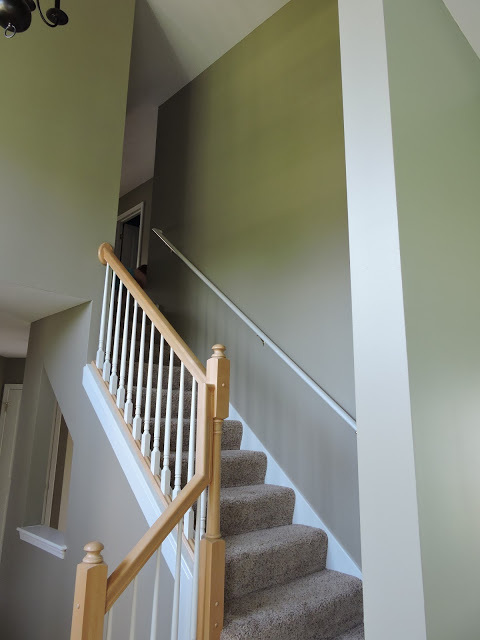 It took him 3 days on a 20 foot ladder and 3 coats of paint so there was no room for color regret. So, I went out of my comfort zone and went with Sherwin Williams “Snowbound”. I know, sounds silly right? White being ‘out of the comfort zone’, But the truth is I LOVE color and seeing it displayed on the walls makes my heart happy. This time, I wanted our entry way to be classic and timeless. I wanted to be able to switch out the decor from time to time without worrying about it clashing with the wall color. I also knew I wanted to bring in some bold colors and prints with fabric, wall art, and the front door. Plus, how could I compete with that wallpaper? It definitely need to be the showstopper! White paint allowed me to let those areas shine. Because there was so much pattern going on with the wallpaper and the bench fabric, I was very intentional about the decor selections. I didn’t want a pattern/color explosion! I carried the florals that were in the fabric throughout the space to make it cohesive and to continue the summer flare. I chose this pale pink peony print (say that 10 times fast) with a beachy-wood frame for the wall along with the other frames in this gallery. I don’t know about you but this print screamed summer in the prettiest way. I threw in a picture of my daughter and niece at our a rental vacation house on Lake Michigan and a cheeky print from The Crown Prints. After all, all you do need is love and ice cream amiright? 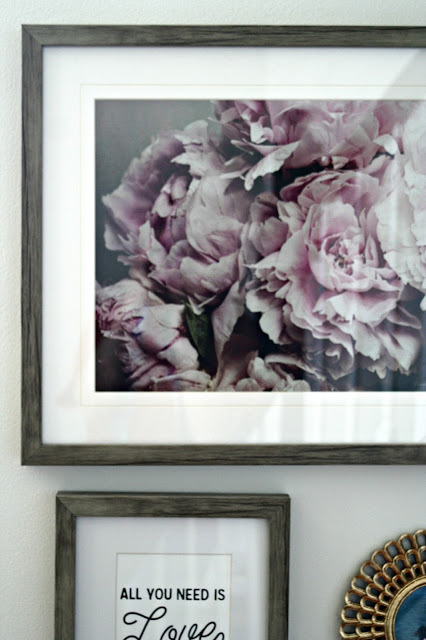 The peony print and frames are all from At Home.
. I’ve been on the ‘mixing metals with wood tones’ bandwagon so these frames were just what the room needed. The board by the back door is a DIY by yours truly and will be an upcoming post. It definitely has it’s own story to tell. It’s currently sitting too high, but we ran out of time to fix it. (Oops you can blame lack of sleep on that one). This refresh has also made the laminate tile floor look oh so ugly. Add it to the list! 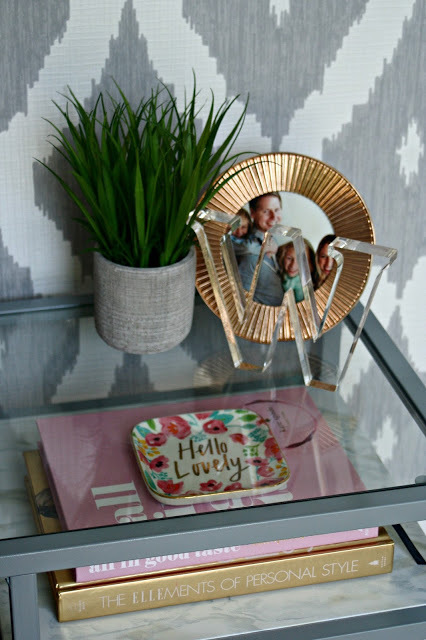 How cute is that little magnetic plant?! 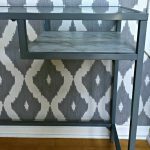 I shared our console table (Ikea Hack) here and have slowly but surely been re-arranging items on it to see what looks best. It has looked different almost every day as I walk by and remove or replace something on it. I went with a single lamp despite by need for symmetry. In this space, two lamps seemed overpowering so I had to embrace the change. I picked up this lamp and shade from Target for under $40 and I love the gold trimmed base. The best part of this vignette is the gold sunburst mirror from At Home. 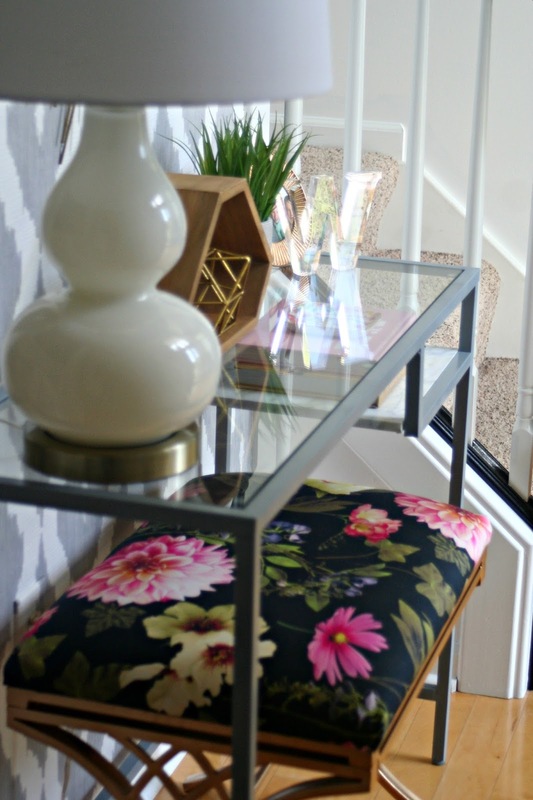 I had been eyeing this since I started planning the foyer and it was the last one left in the store! Phew! The gold sunburst is warm and welcoming as you enter the home…and we all know I love gold & mirrors. 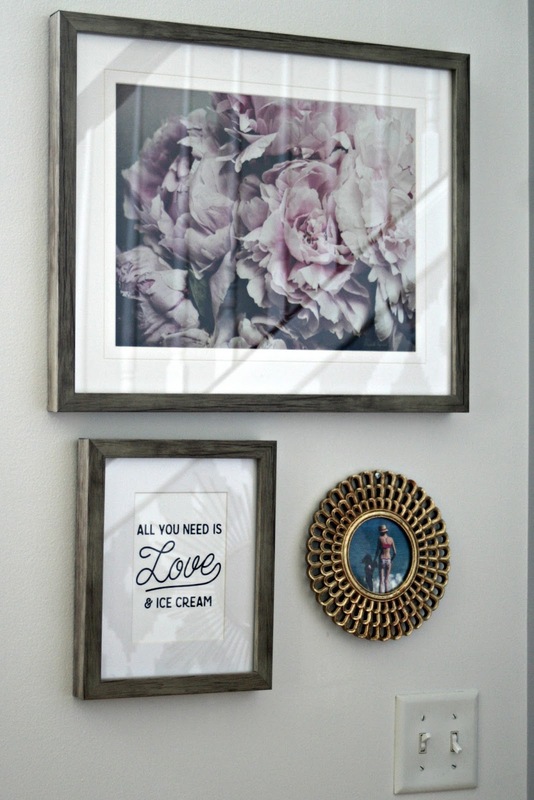 This was the perfect summer decor addition to the space! I also added this sweet little floral dish onto the table. 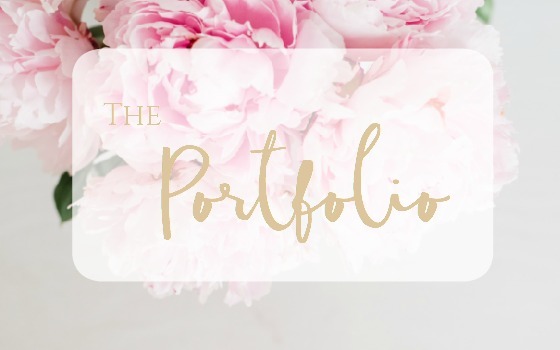 I love the vibrant pops of color, the gold letters, and the summery vibe it has. 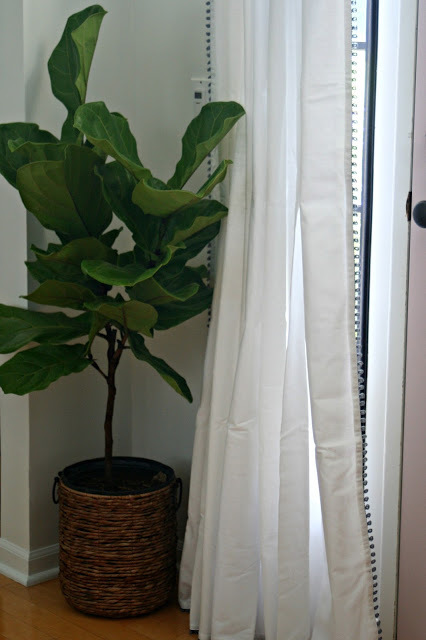 Adding natural elements its a fun way to bring summer indoors and this little potted faux plant does just that. All the look of a cute little live plant but none of the maintenance! You’d never know it wasn’t real! (Both from At Home). Since I couldn’t swing the acrylic table I wanted, I bought this acrylic ‘W’ as an homage (Hobby Lobby). And can we just pause and and have a moment of silence for that pink door!! Oh it makes my heart so happy! I’ve been wanting a pink door for months and I finally got it! 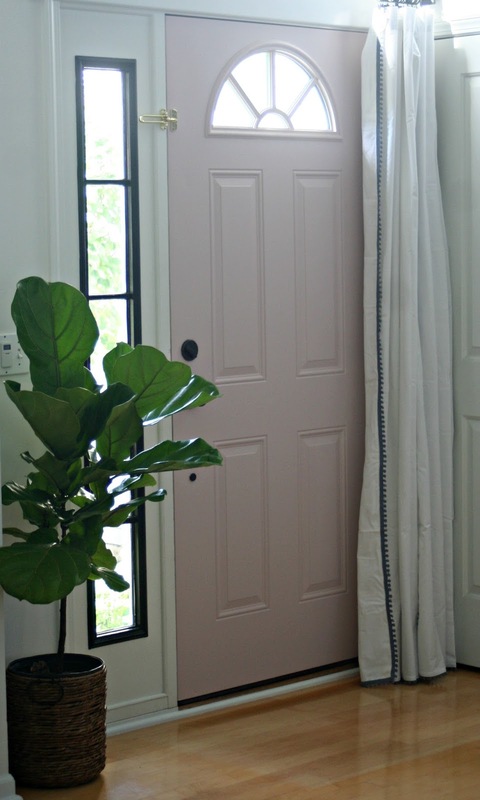 Thanks for my gal Andrea over at Sherwin Williams, she custom made a pink that is too perfect for words (SW ‘pinker Breathless’) The black trim sidelight is like the icing to the cake. 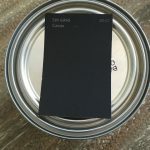 Now, I want to paint all the window frames black! It’s so chic and classic. It’s hard to capture this color on the screen with the white walls and sun bouncing around the light, but I can assure you its heavenly. The absolute perfect shade of rosy pink. Now here’s where I have perhaps lost all my marbles. 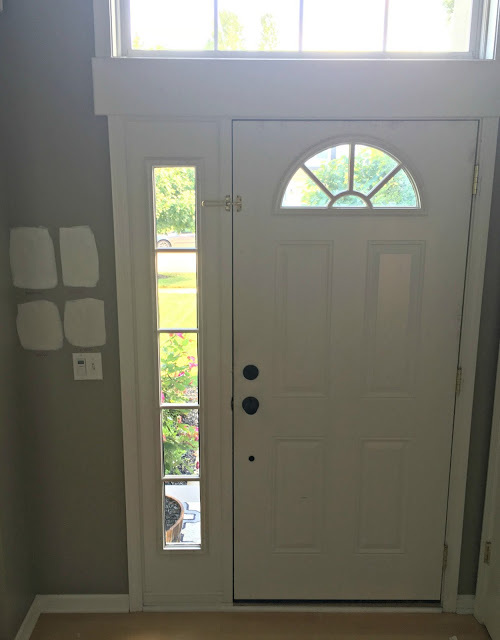 You all may think I’m crazy, but I added a curtain rod and these fun grey fringe panels to the front door for two reasons 1) privacy and 2) why not?! I love how curtains can warm up a space and with the tall white walls this was a much welcomed addition. I. love. it. (Curtain rod is from At Home and curtain panel is Nate Berkus at (Target). If I want the sidelight to let in all the sunlight, then I just pull the curtains over to the other side. The large vaulted window above the door also allows plenty of light to shine in. This room receives the most sunlight in the house. My husband literally asked “why are we hanging a curtain rod and curtain above our front door?” Because, love. Because. 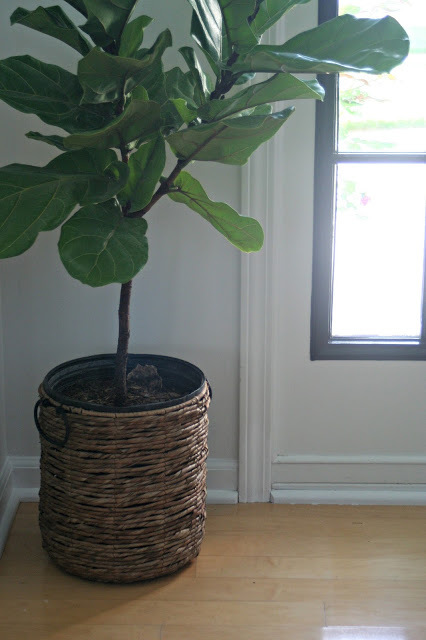 Speaking of love, see the Fiddle Leaf Fig? She’s my new BFF. Time and budget will determine the rest so I’ll be updating as we go along. 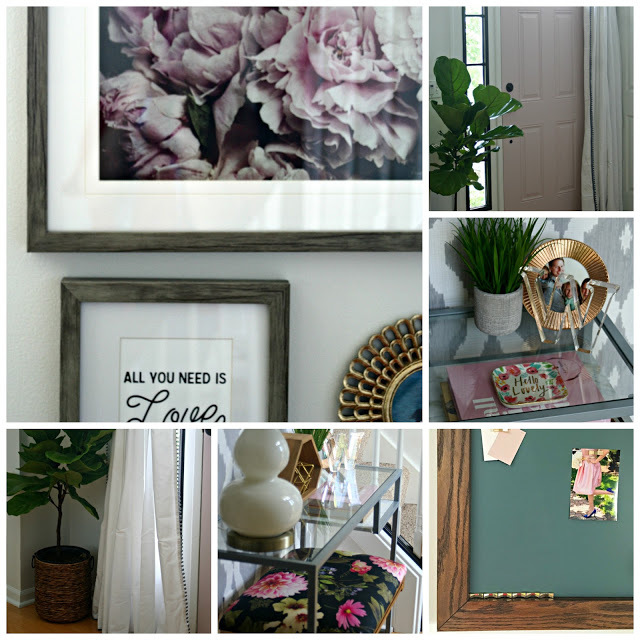 Thank you so much for joining along today as I share with you our entry way and its summer updates! 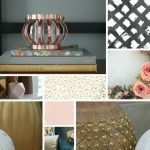 Thank you At Home for the decor mecca of yours to give me endless possibilities in adding affordable furniture and decor to my home. 3. 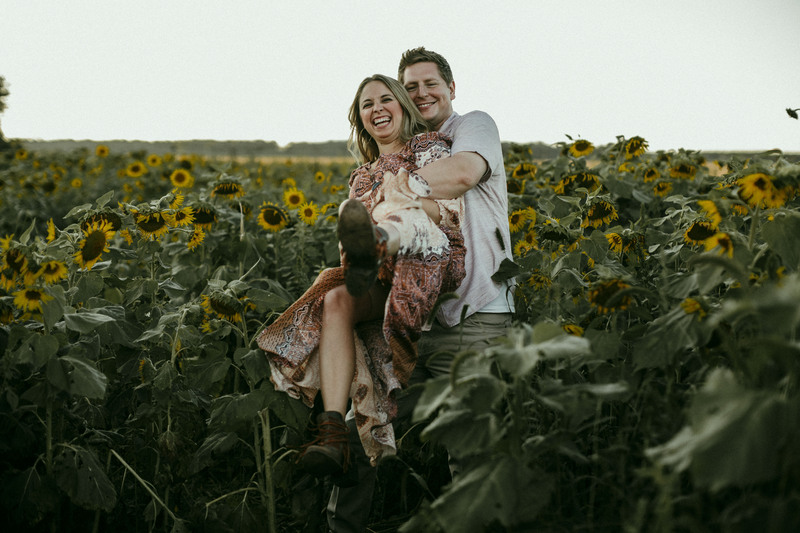 Tag one of us in your picture so we can leave you some love! That’s it guys! Good luck! 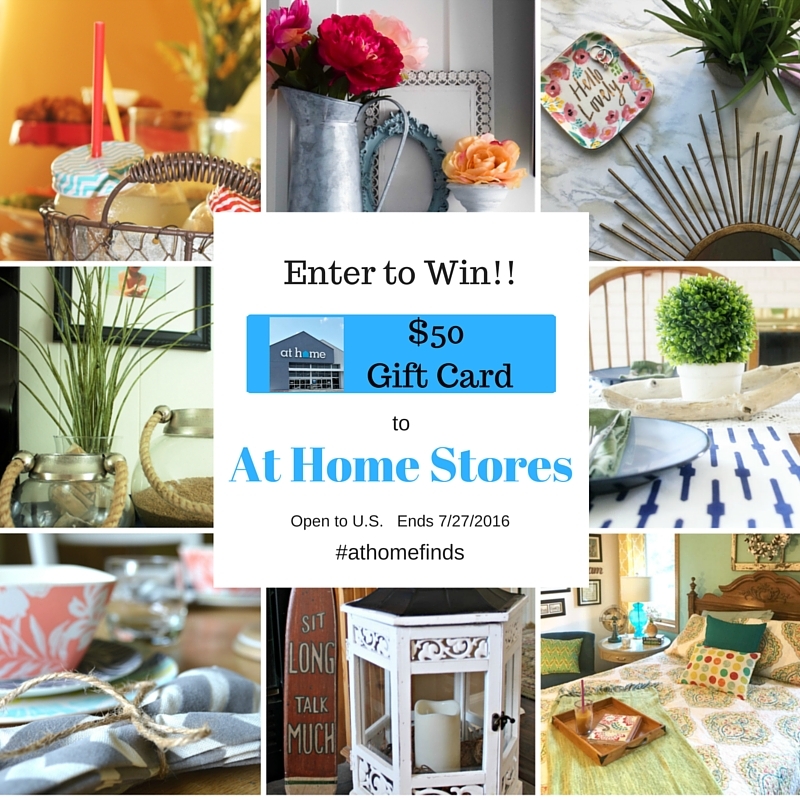 The winner will be chosen in 2 weeks…so head out the door and get shopping! Or, if you already have some At Home summer finds, get posting! Seriously, great job! I think white walls are a perfect choice for an entry, because, like you said, then entry sets the tone for the home and a neutral wall lets it be timeless. I am so crazy about your pink door and I LOVE the black trim. 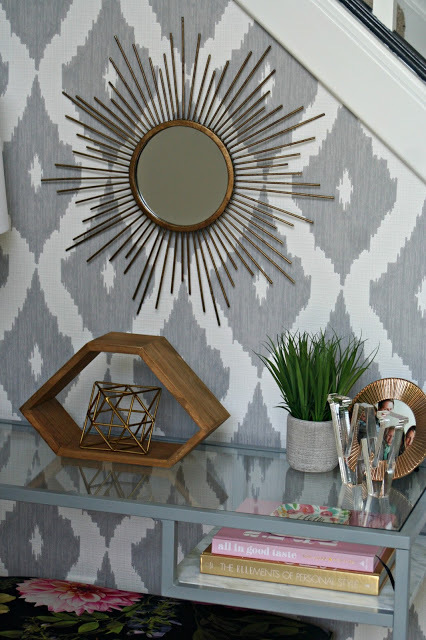 The sunburst mirror is perfect next to the angle of the stairwell. 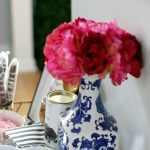 And I love the peony print! 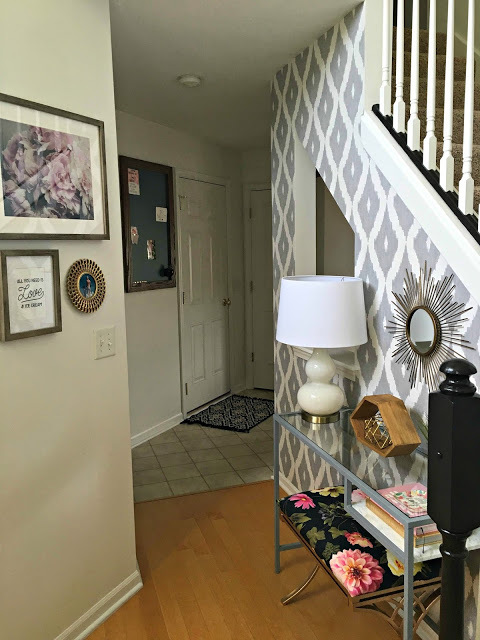 Your foyer is amazing!! 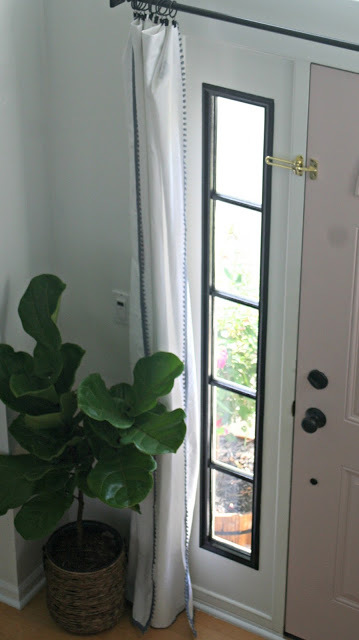 I would have never thought to put curtains by the front door, but, even if you don't use them they make the space feel more comfy and warm. 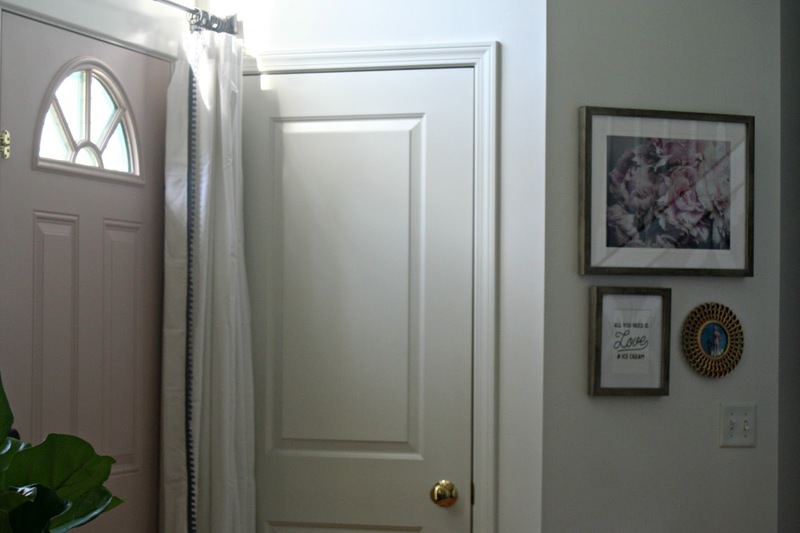 I so love the pink door with the black trim and all the details to tie it together. 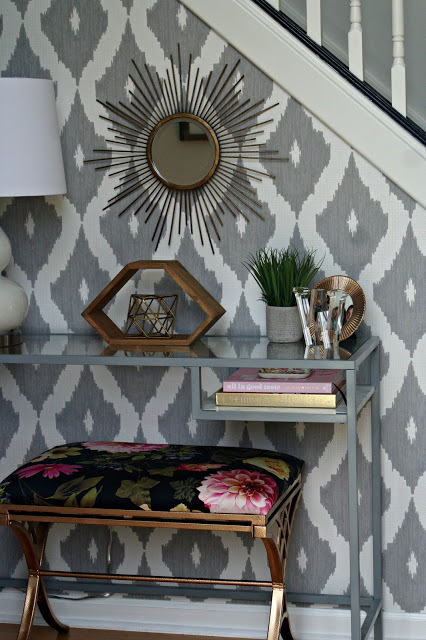 Colette, you really hit one out of the park with your new foyer! 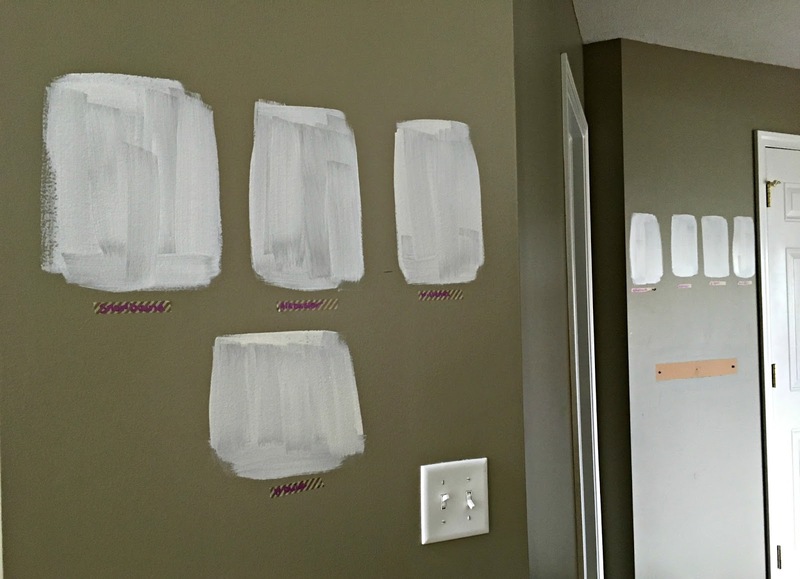 We repainted the inside of our entire home 2 summers and still talk about how much work it was! Love your color choices! I think the pretty floral Hello Lovely dish is my favorite thing! 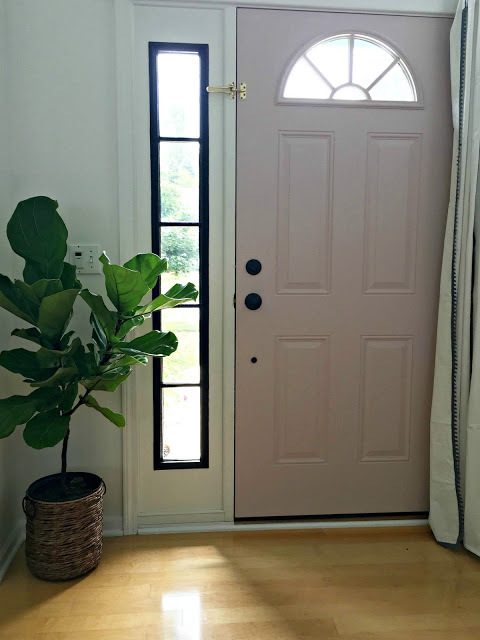 I love that you have a pink door – that is so cool! Nice work, I can't wait to see the finished foyer! Wheeee, so glad you got to take this one off your list. That pink door with the black trim is the best! I love all the touches of summer you brought in. It has been a labor of love for you but I know you are enjoying the new look. Thanks Sarah! I am so happy I took the risk both with the curtains and the pink/black! Thank you!! I am so happy with the way it turned out! 🙂 But, boy was that exhausting! I love how you decorate to what you love and makes your heart happy. Isn't that what all your time and effort should be about? I love color too but am trying to refrain and just use it as accent. Love your pink door! I love the way you organized everything and made your house looks more awesome! Thanks for sharing those tips. Thank you, great job. My excitement is increasing after viewing each of your photos. It was wonderful and beautiful. I really like it. I’m definitely inspired by your pictures and sharing. Just look at how gorgeous those living spaces are I want to make my own DIY project to bring more summer scent to my house. Thanks for your post. I picked out SW breathless for my girls room but I’m nervous it’s going to be too dark and/or have too much purple undertones. I know i can do only 50% of the color to make it brighter but why did the person do at SW to make it “pinker breathless”. You’re door looks like the perfect color! *What* (not why) did the person do to make it pinker breathless? Hi Lauren!! I’m not sure what the color codes are exactly but I may still have the can – I’ll look at keep ya posted!